As I mentioned in the last post, it was Stiner Massage that got me back to running again and hopefully has finally solved the issue with recurring hamstring issues I have had since 2008. I was able to successfully complete the OBX marathon in a run/walk of 4:45 but that is a long way from being able to pr 4 months later ! I had a long way to go and a lot of work to do to even think about the possibility. But as most of you know I am stubborn and determined and I am surely not afraid of working hard towards my goals and making it hurt. I was already nearly back to my normal mileage and ready to add some real training into the mix but my confidence was low that I would be able to get anywhere near the condition I needed to be. When I signed up for WB I was hoping to start the training from a 3:40 to 3:45 condition but now I was starting back at near zero. The prospects really were bleak and to make things even worse I found myself ready to enter this shortened marathon buildup minus any of my training partners. And that is where the X Factor comes in. Well actually a bit earlier in a way. I have had the pleasure of calling Laura Frey my friend for many years now and we have been big supporters of each others running for all that time but had never run together and I didn't really imagine we ever would. 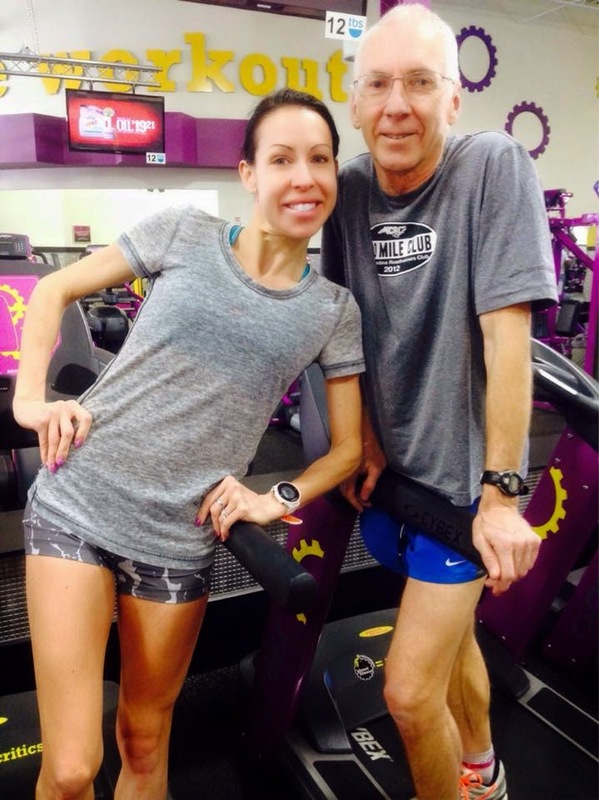 For those of you that don't know her, she is an elite masters competitor and is currently training over 100 miles per week consistently as she prepares for Boston and these are not slow easy miles ! 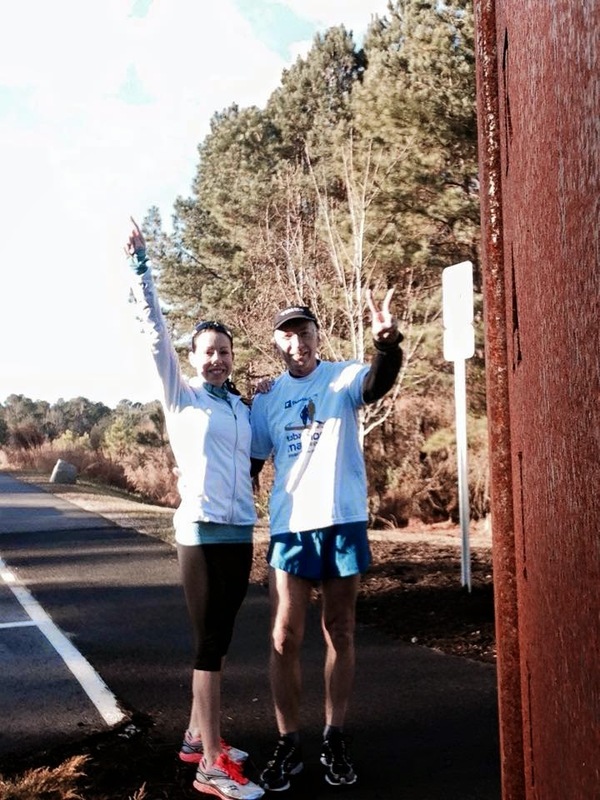 Her slow easy pace is faster than my tempo pace and she does 20 milers sometimes at my 5k race pace ! No one I know is more dedicated to their running than she is and I am inspired daily by her commitment every single day no matter what the conditions to get in her workouts and she does it while still deserving mother of the year award for how she takes care of her 3 kids. It just happened that she was injured with a stress fracture while I was out with my hamstring and during that period we were pushing and encouraging one another in our cross training as we tried to maintain as much fitness as possible. Once we were both finally able to run again the support for each other was still there and growing stronger. I think their was divine intervention going on but for whatever reason she stepped up the support as if knowing instinctively that I needed someone to believe in me and help push me to achieve my dream. And so there I was in early November full of doubt but determined I was going to give everything I possibly could to this training cycle ready to push my self as hard as I could. Miles, tempo runs marathon pace runs whatever it took I was going to endure. I stepped up the already hard crosstraining working the glutes, the core and doing even more with the weights. So I was still surprised when Laura agreed to run with me one Friday. it just happened that Friday was her easy day on the schedule and her easy pace just happened to be the pace I was hoping to run my tempo runs. I was a bit nervous that I would not be able to even stay with her and I was afraid that after one run she would figure out I was just too slow for her and it would be a one time deal. Much to my surprise and pleasure we had a wonderful time together and I nailed the workout. We had already started looking ahead to the next one and have now been meeting just about every week since then on what we call Fun Fridays, which are the highlight of my running week. We have done fartleks and repeats of half miles and miles and even marathon race pace runs. Now you know I am not afraid to make it hurt but I have never been pushed so hard in my life. On most of these runs by the end I am nauseous, having stitches and most of the time end up dry heaving ! But she is so patient with me and is constantly encouraging me along. I know if I had been doing these workouts alone I would have backed off the pace but she believes in me so much that I didn't want to let her down so I would never bail on a workout no matter how much it hurt and as a result I would reach a new level I didn't think possible each week. It was just so wonderful to have someone that if she desired could leave me in a cloud of dust at a moments notice but she instead runs along monitoring my stride and breathing and making me feel that my success was almost more important to her than to myself. And best of all it really was fun and we are always laughing even when about to throw up ! And in addition to the running she is my # 1 cheerleader and refuses to let me get down when I feel frustrated or doubting myself. In other words she has been the most awesome friend and training partner I could ever hope for and know matter the outcome this Sunday I know I would not be anywhere nearly as well prepared as I am thanks to her . I had originally wanted to be in shape for a pr of sub 3:35 but I am going to go conservative and just go for the BQ of 3:40 which is another thing. All my desire to go to Boston again was goneafter events beyond my control but I still had a burning desire to go for the time and the pr and that was what driving me. But now thanks to Laura I am determined to go to Boston one more time and I am already saving up for the trip ! You never really did say exactly what magic John Stiner did. Just massage? New exercises? Cross-training? Run differently? 3:48:37!!! I hope this means ya got the"BQ" ya wanted,prob best marathon in Years! !Congrats!